Book 2 in the fantastic four book series about taking risks and flying high. After accidentally opening the car window at the car wash, Ricky is grounded. No movies, no swimming, no phone. And definitely no flying. But he has a plan. The school concert is coming up and he has the... read full description below. 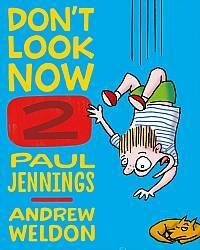 Paul Jennings has written over one hundred stories and won every Australian children's choice book award. Since the publication of Unreal! in 1985, readers around the world have loved his books. The top-rating TV series Round the Twist and Driven Crazy were based on his popular short-story collections such as Unseen! In 1995 he was made a Member of the Order of Australia for services to children's literature and he was awarded the prestigious Dromkeen Medal in 2001. Andrew Weldon's cartoons have been published in Australia and internationally, including in The Age, The New Yorker and The Big Issue. He has published two cartoon collections - I'm so sorry little man I thought you were a hand-puppet and If you weren't a hedgehog. If I weren't a haemophiliac. His most recent book is Lazy Daisy, Busy Lizzie, created with his partner, Mary Ellen Jordan.